​American pride and pageantry was on full display Saturday as 101 of the nation’s premier high school football players faced off in the 16th annual U.S. Army All-American Bowl in San Antonio, Texas. The West defeated the East, 37-9. But the game goes beyond the field it’s played on and the final score. 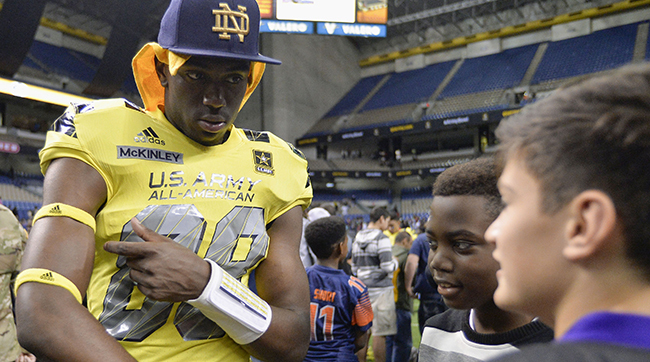 The players involved in the All-American Bowl are the country’s best. Yet being selected to play in the bowl takes more than just talent. Scouts working with All-American Games visited more than 600 high schools around the country and picked athletes with traits similar to those of an Army soldier. 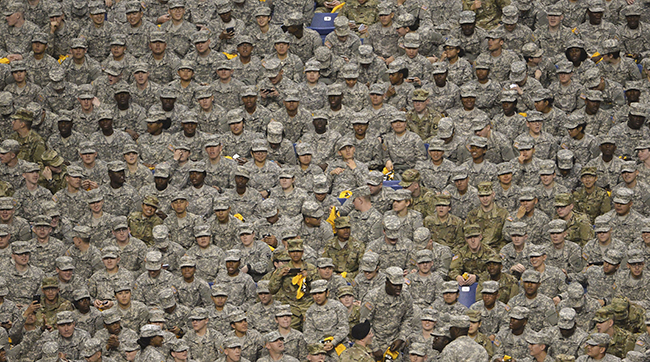 Among the announced attendance of 39,121 were hundreds of Army soldiers, who filled four entire sections in the lower bowl of the stadium. With so many uniformed men and women in the stands and on the sidelines, you couldn’t help but feel patriotic. ​​Just as the soldiers appreciate the talents of these star athletes, the athletes understand the true honor of being in the U.S. Army All-American Bowl, too. Throughout the week, players participated in community engaging events, such as visiting a local children’s hospital. Many of the players mentioned how important this game is in allowing them to be role models in more ways than what they do on the gridiron. The inaugural All-American Bowl was held in Dallas in 2001. But the next year, the game was moved to San Antonio and has been hosted in the Alamo City ever since. The covered Alamodome ensures the game is always played in perfect weather, and the city shows great support. Attendance has been less than 30,000 only twice in the game’s history at the Alamodome. ​​With all the festivities and meaning surrounding the game, it’s easy to forget that the players are elite four- and five-star athletes with an extremely bright future. Many NFL stars were once a part of this game, including Andrew Luck,LeSean McCoy, Jamaal Charles, and Odell Beckham Jr.
A few players committed to universities during the game, while others many already announced where they’ll play next. Offensive lineman Ben Cleveland, for example, is headed to the University of Georgia. 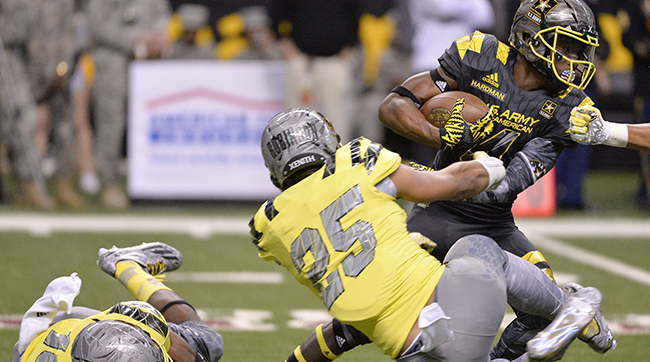 “One team” is a fitting way to describe the atmosphere of the U.S Army All-American Bowl. Two seemingly different, yet very similar uniforms unite in one place to provide one meaningful game of football.